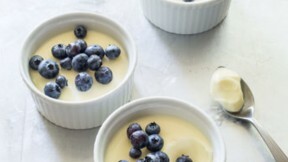 This lemon posset recipe is from America's Test Kitchen. Combine cream, sugar, and lemon zest in medium saucepan and bring to boil over medium heat. Continue to boil, stirring frequently to dissolve sugar. If mixture begins to boil over, briefly remove from heat. Cook until mixture is reduced to 2 cups, 8 to 12 minutes. Off heat, stir in lemon juice. Let sit until mixture is cooled slightly and skin forms on top, about 20 minutes. Strain through fine-mesh strainer into bowl; discard zest. Divide mixture evenly among 6 individual ramekins or serving glasses. Refrigerate, uncovered, until set, at least 3 hours. Once chilled, possets can be wrapped in plastic wrap and refrigerated for up to 2 days. Unwrap and let sit at room temperature for 10 minutes before serving. Garnish possets with berries and serve. This dessert requires portioning into individual servings. Reducing the cream mixture to exactly 2 cups creates the best consistency. Transfer the liquid to a 2-cup heatproof liquid measuring cup once or twice during boiling to monitor the amount. Do not leave the cream unattended, as it can boil over easily.